The Inspire body care line was created in 2007 out of the need to find skincare products for our children that were free from harsh chemicals, while also being nourishing for the body. Our original line was called Green Pad Living, and it consisted of bulk soaps, body butters, sugar scrubs, and bath salts. As fate would have it, being in the right place at the right time one afternoon at a farmer's market in front of Whole Foods Market, our line was picked up and featured at the launch of their Local Vendor Program in 2009. The product line grew so quickly that we weren't properly prepared for the rapid expansion as well as the time and energy it would take to continue to grow the company. After deep thought and consideration, we decided to close the line temporarily in 2013 giving our family a chance to regroup, recharge, and figure out how we wanted to move forward next in a way that was all inclusive and supportive of our lifestyle. We wanted to shape the business around our lives, and not our lives around the business. Today, 100,000 soap bars later, we've re-launched our line and branded it with its new name, Inspire Pure Botanicals, and it's better than ever! Through many years of experience and some very challenging times, we've not only learned a TON about business, but we've grown to understand the importance of promoting sustainable products that contribute to the well-being of the entire planet. We're all in this together, sharing mother earth and all the gifts she has to offer. This vibration of supporting the whole is what the Inspire line carries with it in each bar, still produced by hand, as close to nature as possible, supporting work for people of all unique abilities. Each bar of Inspire Pure Botanicals Cold Process soaps are made with pure Olive Oil and Coconut Oil, distilled water, Food Grade sodium hydroxide (lye), and pure essential oils. During the saponification process, the lye molecules are converted with the oils, and the end result is a firm bar of soap. The longer your soap sits out, the more it will cure, and become more and more mild over time. This allows for a luxurious washing experience, one that will leave your skin feeling hydrated and moisturized. We suggest keeping your soap as dry as possible in between uses, as it contains no palm oil, a hardening agent....(and a rainforest nightmare!). All of our soaps are made with therapeutic grade essential oils. For those with sensitive skin, it is advised that you stick with our pure Olive Oil bar that is unscented, or something lighter such as Lavender. We do not recommend using bar soap on the face, as the pH of your facial skin is typically much more sensitive than other areas of your body. Many of the herbs we use in our soaps are locally harvested and biodynamically grown! As always, certain soaps work better with specific skin types, so if you have an allergy or aren't sure what is best for your sensitive skin, please feel free to reach out to us and we'll be happy to answer any questions you may have. In addition to our cold process line of soaps, Inspire offers an entire line of glycerin soaps that are equally as lathering and luxurious. Each bar is made with a detergent-free, glycerin soap base, combined with pure essential oils, as well as phthalate-free fragrances in certain varieties. 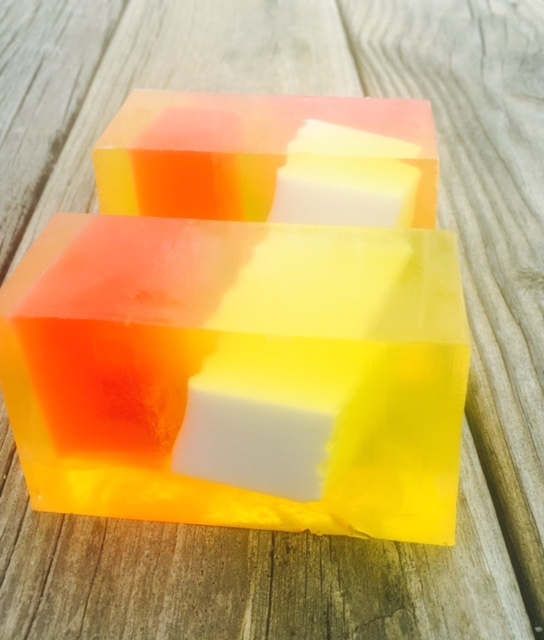 Inspire Pure Botanical Soaps, Shea Butter and Cocoa Butter! *Inspire Pure Botanicals makes no health claims and always advises checking with a physician prior to beginning any new skin care regime. Sensitive Skin? Allergies? Always do a patch test first!